Private and Peaceful ~ This property boasts gentle rolling topography, a small waterway and is laden with large conifer and aspen trees. Beautiful views of the tree-covered landscape exist from every room of the home’s masterfully created interior. Designed by one of Jackson Holes leading architects, the construction craftsmanship is superb and all the expected conveniences and luxuries are present. The interior is spacious and bright with an open floor plan and warm inviting spaces. 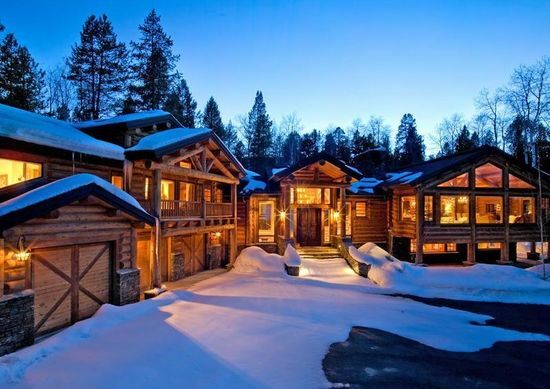 This is a marvelous log home of the highest construction quality. Approximately 7,500 sq. ft. with 4 bedrooms, 4.5 baths and an exceptional master suite and great room. Amenities include 3 wood-burning fireplaces, superb finishing touches in a gourmet kitchen with top of the line appliances, a fitness room, security system, wine cellar, an attached garage with 3 stalls, patio with hot tub and gardens.